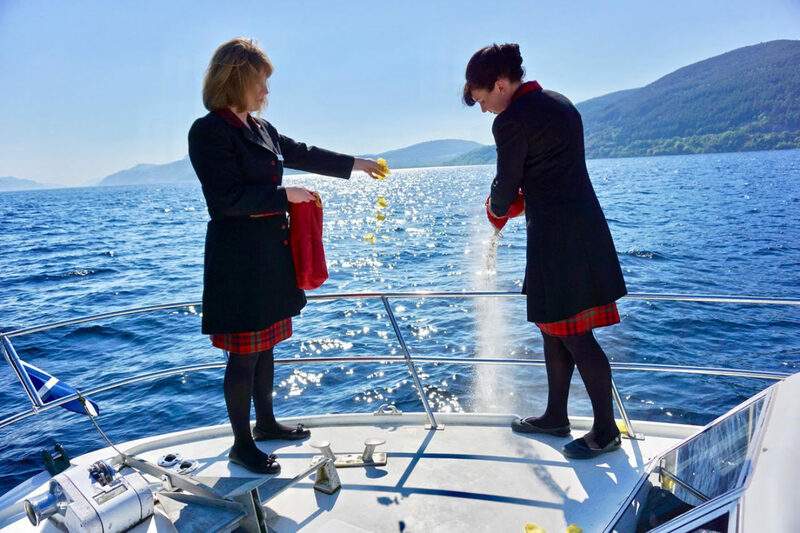 Our Funeral Directors Vicki Fraser (left) and Sarah Maclean (right) scattered the ashes of American Alan Heaton on the shores of Loch Ness, fulfilling final the wishes of the lawyer who died 30 years ago. Almost ten years to the day since we scattered the unclaimed ashes from long-ago cremations to the waters of Loch Ness, the ceremony was repeated in June 2018, fulfilling the final wish of an American lawyer who died in the Grand Canyon 30 years ago. 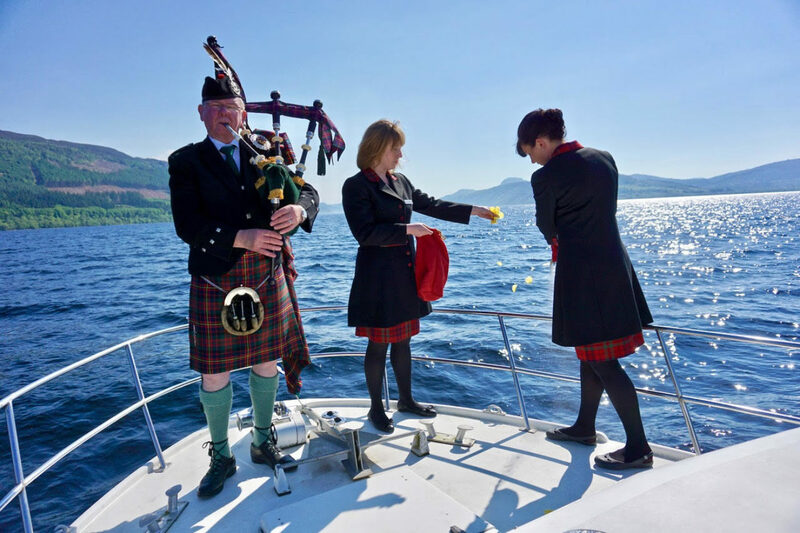 A decade ago, in early June 2008, we decided to conduct a ceremony on Loch Ness, committing long-unclaimed ashes to the loch while a piper played a lament. That ceremony was mentioned in the Inverness Courier in January this year when we held our first Open Day at our newly-refurbished premises in Chapel Street, Inverness. The Inverness Courier also published the story on their website, where it caught the eye of Cherrill Heaton from Florida. Cherrill’s brother Alan Parker Heaton had died suddenly in the Grand Canyon 1987. Alan had told Cherrill in his last letter – received after Alan’s death – that he wanted his ashes to be scattered in the Highlands. He asked his brother to carry out his final wishes. Cherrill kept his brother’s cremated remains for 30 years, hoping someday to travel to Loch Ness to carry out his wishes. But now in his mid-80s he realised he was never going to be able to make the trip. 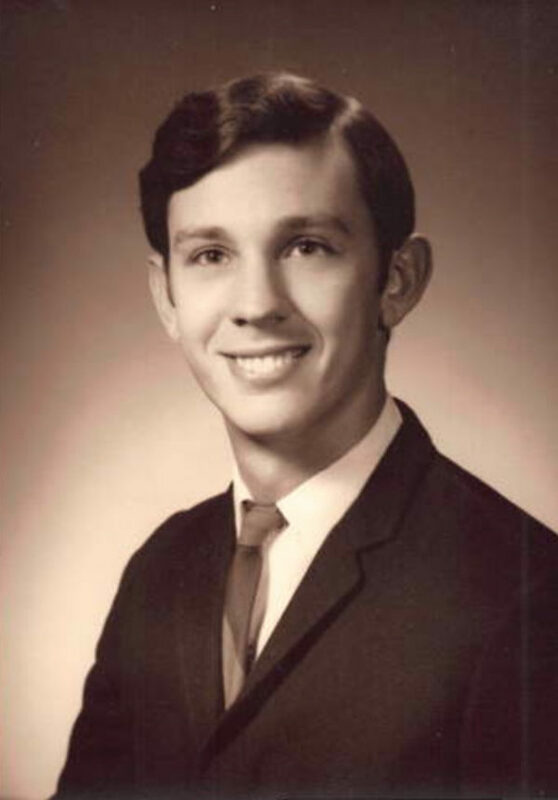 He considered scattering the ashes close to where Alan had died in the Grand Canyon or burying them in the green cemetery in the Florida town where his brother had lived and worked, but none of that felt right. His internet search brought up the story of our earlier scattering on the loch story, so he got in touch. Our Funeral Directors Vicki Fraser and Sarah Maclean took to the water on a beautiful June afternoon, and in glorious sunshine and under bright blue skies we performed the ceremony on the loch. Piper Donald Shaw played ‘Dark Island’, as requested by Cherrill Heaton, and funeral assistant Derek Morrison, who is also a reader in the Church of Scotland, committed the ashes to the water. Piper Donald Shaw played ‘Dark Island’ as John Fraser & Son Directors Vicki Fraser (left) and Sarah Maclean (right) scattered the ashes of the late Alan Heaton onto the waters of Loch Ness. Yellow rose petals were also scattered as a symbol of new beginnings.